The healing properties of stones can be traced back to Native Americans who believed strength could be found in the rock. We’ll take a look at a number of gemstones to discuss their potential healing powers. This is a wonderful stone for anyone who is dealing with gastrointestinal problems, dental problems, or insomnia. Agate is known for increasing stamina while also offering protection, balance, strength, and intuition. If you are looking for inspiration, this stone will help you find it. Amber is known to detoxify the body and is therefore a great stone to help deal with addictions of all sorts, including drugs and alcohol. Amber is also known to help treat chronic conditions such as fibromyalgia and is a great stress reliever. The soothing and calming properties of amber will help improve your overall health while increasing wisdom and intellect. Commonly referred to as the “sobriety stone”, amethyst is another wonderful stone for addicts who are battling with drugs, or alcohol. Amethyst also is known for its ability to relieve pain and assist in the management of a variety of chronic conditions including chronic fatigue syndrome, fibromyalgia, and arthritis. It works well for any chronic condition where conventional medicine is not of much help. This stone is thought to be particularly helpful in providing relief from back pain. It can assist with the treatment of muscular problems and allow the back to come back into alignment. This stone also has benefits for the throat, and the thyroid. These benefits include blood pressure reduction, weight loss, and healing infections. Black tourmaline is a wonderful stone for balancing and removing blockages. It will clear your aura and disperse negative energy. It is a great stone for spinal adjustments and tension release. It helps to protect against radiation and provides general protection. Citrine is a wonderful stone for improving general health as it can be helpful for all organ systems. Because it is also a protection stone, it can help decrease the frequency of nightmares. Citrine provides physical energy, clarity, increased intuition, and creativity. As such, it is useful for the treatment of depression and grief and to lessen the frequency and severity of mood swings. Some even agree it is helpful for the treatment of obsessive-compulsive disorder. The emerald is helpful for any mind afflictions. This stone can also promote domestic harmony through its ability to increase memory, focus, faith, honesty, and romance. The stone also eliminates negativity and around the person or his environment. Known for being a stone that increases prosperity, the stone also encourages general health and wellness, by bringing balance to the body and mind. If you are feeling particularly stressed, this is the stone to have for relief. This versatile stone: provides protection, clears away negative energy, guards against radiation, and treats many diseases of the sexual organs. It may also be effective in the treatment of swollen joints, fractures, asthma, and arthritis. It stimulates the liver to remove toxins. Moonstone is a particularly good stone for addressing women’s health issues. It provides protection during pregnancy and childbirth, as well as control of the pituitary gland. It aids in hormonal balance and menstrual cycle regulation, as well as in the control of water retention. The stone is also thought to help with weight loss. Orange calcite helps to increase creativity, heal sexual disorders and reproductive issues, and because of its highly energizing properties, can also be used as a treatment for depression. The stone also helps with emotional fears, mental breakdown, and chronic fatigue syndrome. Rose quartz is another stone that provides protection during childbirth. It heals emotional trauma while also increasing sexual function and slowing the age process. Rose quartz is useful in treating migraines, earaches, and sinus problems. It may also be helpful with weight loss, addiction recovery, and depression. It may also help improve circulatory health, kidney function, and fertility. Known as the “Master Healer” this stone is thought to serve as the energetic “bridge” between earth and Heaven. It has protective properties, and also serves as a good luck charm. Giving turquoise as a gift is suggested to magnify its powers up to 100 times. As a communication stone, it helps you speak the truth out of love. 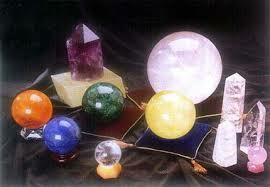 You must choose the gemstone you want to use for healing power on your own. Choose the ones that appeal to you and draw your attention. There are many gemstones with overlapping qualities, so there could be a number of stones that will provide health benefits. When you first get a gemstone, cleanse it to remove energies from anyone else who has touched them. Plan on purifying your gemstones on a regular basis to ensure their energies remain strong. To purify the stone, place it in a non-metal container filled with non-iodized sea salt for 12 hours. If you find the stone outside, spend some time holding it before you wash it to remove the dirt. There are several ways to use gemstones for healing purposes, but because they are natural sources of energy you do not need to go through an elaborate process to obtain the energy. You can wear them around your neck, place them throughout your home, or simply carry them in your pocket. It’s important to note that if you keep metal around the gemstone it can block the energies, so traditional jewelry typically will not provide the healing effects. When you purchase your gemstones, make sure they are natural and unaltered.